Yesterday, Election commission of India announced dates of Assembly elections in five states of India. These elections will take place in the month of November and December, and finally results of all polls will be declared on 8th Dec. These elections are believed as semi-finals for Loksabha election 2013, and many say, it is test for Narendra Modi, BJP’s Prime-minster candidate. At present, Congress has state governments in three states Rajasthan, Delhi and Mizoram; while BJP has state governments in Chhattisgarh and Madhya Pradesh. Delhi’s CM Sheila Dikshit has already done hat-trick by winning Delhi assembly elections three times in the row. While BJP’s CM from Madhya Pradesh will like to do hat-trick. For the final outcome, we are required to wait till 8th Dec, 2013 when whole of nation will see results of these assembly polls. With these polls, by-elections for Surat West Assembly seat in Gujarat and Yercaud (ST) assembly seat in Tamilnadu will also take place. EVMs (Electronic Voting Machines) will be used for voting in all these states and Photo identity cards will be used to verify voters. 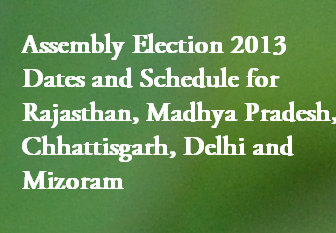 Below read detail update on important dates and schedule for Assembly election in each state.